Puppet Shadow plays with the ideas of virtual and physical. 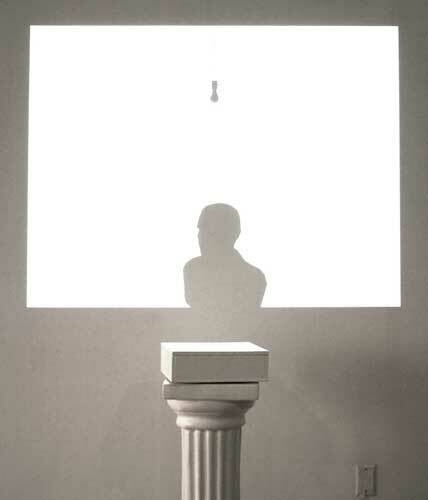 The installation consists of a physical pedestal with a projected image on the wall above it. The projection shows what appears to be the shadow from a bust on the pedestal and a light-bulb hanging above the bust. While neither of these objects exist in physical space, their shadows are present. Puppet Shadow permits contemplation around virtual and physical co-mingling. It subtly calls reference to our own virtual or on-line personalities; and how those identities interact with our physical bodies, environment, and social interactions. It encourages active bodily movement. Puppet Shadow also looks at mixing virtual and physical outside of the monitor, keyboard, and mouse default. There are two methods of participant interaction. First, they can rotate the physical pedestal. Turning the pedestal causes the image of the bust shadow to turn. Second, they can use their own shadow, created by the projector light, to push the image of the light-bulb shadow. The light-bulb acts like a light source for the bust. Pushing the light-bulb causes the bust shadow to distort. Participants create change in the artwork with these two methods: physical body to physical pedestal, and physical shadow to virtual shadow. Puppet Shadow is written with OpenGL. Pedestal rotation data is acquired from a wireless mouse inside the pedestal. Shadow tracking is derived from web-camera video. 3D models werecreated in Maya.